We got an early start and headed out for a walk through the shopping district and into the old city center. The city sits at the intersection of a huge lake and the bay. There are a series of locks between the two. Many old bridges connect the different islands of the city. The parliament building was our first encounter. No guards. Interesting. The quiet and narrow streets of old town. Local peasant wear in one of the shops. The Nobel Center was still closed so we visited the cathedral. Once a Catholic church, now Luthern since the reformation. Interesting Hebrew inscription above the pulpit with no literature to explain it. 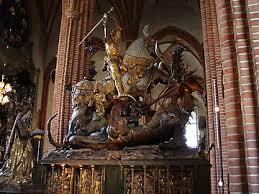 And then this magnificent statue of St. George and the Dragon, Stockholm's patron saint. The Nobel Institute. We enjoyed a guided tour of the center, viewed many artifacts and learned more about the various recipients of the prize since 1900. Each winner is asked to autograph the bottom of a chair in the cafe. I must have turned over dozens looking for a few of my heroes. We had lunch in the plaza before heading over to the royal palace. We first toured the basements where they had many interesting historical accounts and displays. Then we headed upstairs to tour the public, and private rooms. No guards and no security. Wow. More of those great Scandinavian ceramic room heaters. You'll see one in Coupeville in about five years. Love this marble piece. The textures were superb. We finished up outside with great views of the canals before heading over to the Medival Museum. The museum houses the finds made while excavating for a garage under the parliment building. Stockholm in 1100 AD. Some recreations enhanced the artifcats. Then we headed over to the main shopping district for supplies.before calling it a night.